Golden Horn was beaten into second place by Aidan O'Brien's Found in the Breeders' Cup Turf in Kentucky. Favourite Golden Horn was aiming to be the first horse to win the Epsom Derby, the Prix de l'Arc de Triomphe and the Breeders' Cup Turf in the same year. But the 4-1 second favourite, ridden by Ryan Moore, finished strongly to triumph by half a length. It was O'Brien's fifth win in the Turf. He is now the third most successful Breeders' Cup trainer with 10 winners. "She is a very special filly," said O'Brien. Prior to the race, Golden Horn's trainer John Gosden voiced concern about how his horse would handle the loose, sand-based turf course at Keeneland, which is hosting the Breeders' Cup for the first time. Golden Horn, ridden by Frankie Dettori, was the first to seize the lead from Shining Copper after the early pace-setter was reeled in by the field. "Found got her revenge on Golden Horn after two recent runs in defeat by that horse - runner-up in the Irish Champion Stakes and ninth in the Arc - when both times somewhat luckless. The rain-softened ground didn't help Golden Horn but after the year he's had, he's lost nothing in defeat, still retiring a great. "The result also highlights the consistencies of racing's drugs rules: unlike Found, Golden Horn didn't run on the diuretic Lasix (reduces internal bleeding), which is allowed in US races, but banned in Europe." However, Found was perfectly positioned by Moore and once the filly got her nose in front she kept it there to send Golden Horn into retirement without the historic victory some had anticipated. Found gained revenge for trailing by a length to Golden Horn in the Irish Champion Stakes in September. 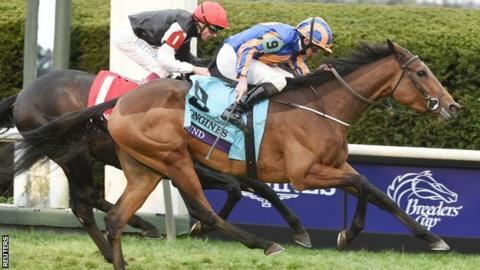 O'Brien is the only European trainer to win in Keeneland at this week's Breeders' Cup after Hit It A Bomb, also ridden by Ryan Moore, won the Breeders' Cup Juvenile Turf on Friday. If Golden Horn failed in his quest, 4-6 favourite American Pharoah encountered no such problem in the final - and most valuable - race of the meeting, the Classic. American Pharoah led from the first strides and never looked like being caught for the £1.75m first prize. The first Triple Crown winner since 1978, the three-year-old became the first horse to add a Breeder's Cup to victories in the Kentucky Derby, Preakness Stakes and the Belmont Stakes, beating 100-1 shot Effinex.